With many years of experience since its inception, the company specializes in manufacturing a host of torroidal transformers, stereo coupler, sensor, output transformers, current converters, and automated voltage attenuators. The company is committed to ongoing research and development, with stepped-up customer service, as it prides itself in service you at all times, where all products are subject to the most stringent quality control before shipping to earn great customer confidence and total satisfaction. 1 The company designs products duly taking into account applications for different regions, climatic variations, temperature fluctuations, and humidity changes. Incorporating our extended know-how, together with improvement made to prolong the life cycle of a product's parts and components, we aim to offer the most comprehensive service ensuring that the customer is availed to the highest quality goods at the most reasonable costing, as the best guarantee to our valued customer, in addition to our customized sampling plans. We welcome inquiries from globally competitive manufacturers or trading houses for long-term collaboration, and we are always at your service irrespective of the quantity or sample test run. 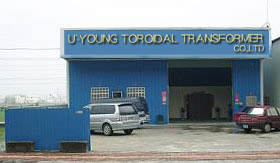 U-YOUNG TOROIDAL TRANSFORMER CO., LTD.